Larisa Ilchenko put in a late charge to overhaul Britain's Keri-Anne Payne and Cassie Patten for victory in a dramatic 10km marathon swim in Beijing. The Russian, unbeaten since 2004, took the lead in the final 100m after Patten and Payne had led for most of the race. The Stockport Metro club-mates made the world champion work extremely hard for gold as they won the remaining medals. Ilchenko finished in a time of one hour 59 minutes 27.7 seconds with Payne and Patten just a few strokes behind. Ilchenko set the pace in the opening stages but was soon overtaken by both Payne and Patten. The Russian was content to sit on the feet of the leading pair, even when the British duo tried to make a move after one hour and 32 minutes. With 250m to go, the medal contenders were whittled down to just four, with Germany's Angela Maurer joining Payne, Patten and Ilchenko at the front. Maurer, though, was unable to match Ilchenko's burst of pace as the Russian pulled alongside the British pair. Payne fought back, matching her stroke for stroke until Ilchenko inched ahead for the win. Patten clocked 1:59.31s and was unhappy at some unsporting tactics in the closing stages. "I was quite annoyed, it's not sportsmanship when you pull on someone's feet," she said. "The last kilometre felt like 20km - every time I looked up the finish seemed no closer." 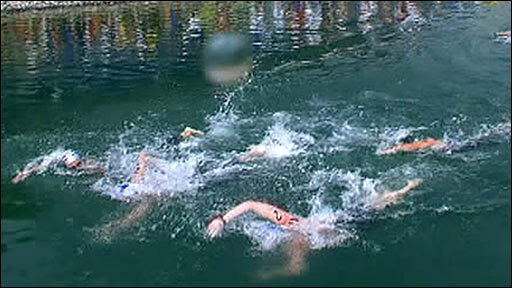 Although the Britons swam together for most of the race, they said that the move had not been planned. "We didn't talk at all out there, we're best friends, we train together and we just kind of knew when to kick at the right time," said Payne. South African Natalie du Toit, the first female amputee to take part in the Olympics, finished a highly respectable 16th in 2:00:49.9. "I went out there and gave it everything, which was my goal," she said. "I had a good race but I'm glad it is over. "I still have to keep focussed and train for the Paralympics."